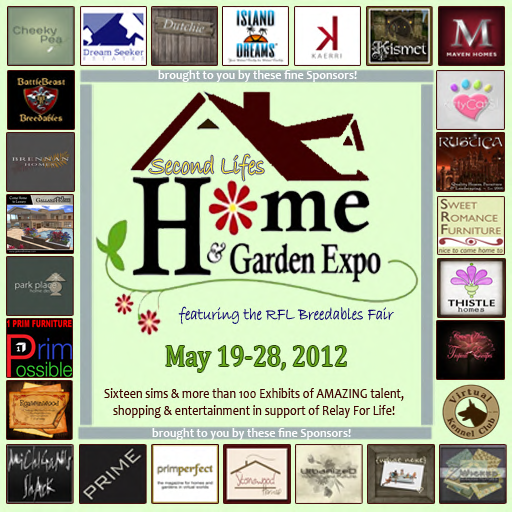 Home & Garden Expo 2012 – Run, Don’t Walk! | Hey Girlfriend! Home & Garden Expo 2012 – Run, Don’t Walk! It’s one of my favorite times of year in SL, a time when (just like I do in RL) I get so excited by all the pretty new houses and gardens and just wish I could move in to all of them. It’s Home & Garden Expo time! Sadly, this event is much much too short, for as big as it is, and for as much as there is to see and do, there is just never enough time. Tomorrow, the 28th, will be the last day for this years Expo, so drop what you are doing now, and run, don’t walk, there. I’d originally planned to do several postings, with the theme of “moving in” to builds so compelling I’d no choice but to just…move in. As usual, my hopes were much larger and more extravagant then I could pull off, and stuff happened, and I missed a few days, and then I managed to spend a day or two taking many many pics for putting into some posts. RL plans were to visit family for an extended holiday week, so I tuned up the ol laptop so I could blog while away, saved my pics to a jump drive, and we hit the highway for the big city. I guess its time I get with the times, as I should have saved the pics to a cloud or some such, as it turns out, the drive was corrupt, and I am miles away from my PC, and…my pics of the lovely Expo!!! I apologize to all the builders and designers at Expo, for I am unable to show any pics of their amazing and captivating creations this year. Everyone must take my word for it, and trust that it is worth the time, and the inevitable lag, to go spend some time (and Lindens) at this years Expo. I also suggest you peek back at earlier postings on this blog, Jeni’s got some beautiful pics of Expo to give you some temptation and encouragement. I’m sure by now you’ve heard that Home & Garden Expo benefits RFL, and that many of the best designers have special items out for their donation items, but I’ll tell you again. I don’t know how many there are for sure, but there are 14 sims full of them. At this late date, I’d suggest you quickly check the Sim Listing page and pick your favorites and head on over. Turn your graphic settings down low, de-script yourself, dress comfortably, grab your beverage of choice and get power shopping now. Expo ends tomorrow, so seriously, Run! Don’t Walk! Run! Immediately! I’ll be back home in a few days, so keep an eye on my flickr and I’ll get a few of my favorite pics posted there. Dutchies, Rustica, Insight Designs, L2 Studio, What Next, Sway’s, Windowshopping with Neva Crystall, New Trails, Organica, HomeKraft, Tether’s End, Funky Junk, Thistle, Abiss, Weather! or Not?, Trompe Loleil, Barnesworth Anubis, Hanaya, Interior Addiction, Cheeky Pea, Second Spaces, Mudhoney, Clutter, reBourne, Alchemy Immortalis, True North, Leezu, KittyCats and sooooo many more that I didn’t get time to look at. Make notes, as I did, and make sure to visit the main stores after the Expo. Have a great holiday if you’re in the US, and a great day if you’re not, and see you at these shops, or others, soon! Say hi if you see me out and about, you just might find yourself in a future blog post!! DreamSeeker Estates – Expo Underwriters – That means without them, nothing. These people are amazing, they do so much for us all. See them for all your land needs. Sim Maps and Listings – You’ll need this for power shopping. Preview Pics of Exclusive Donation items you will want to get while you can. RFL Official Site – More amazing people doing amazing things.